Let’s ignore this whole god problem and go to the science-worshiping problem. The scientific method uses inductive reasoning, and inductive reasoning is non-rational. Anything 'proved’ with science is no more proof than something 'proved’ with scrying a crystal ball. There’s no argument that science isn’t effective, but to call it perfect, or to call any of the 'laws’ knowledge wouldn’t be a rational thing to do. Which comes to the deeper meaning of my post, Why Science? What does inductive science have to offer over anything else? Sure, it’s worked so far, and maybe will keep working, but it’s not the only thing that works. So why not embrace the others? You say that inductive reasoning is non-rational (but don’t tell us why you believe that), but you then say that science is effective, but then you say science doesn’t generate knowledge. Then you say again that science works but suggest there are other things that work and suggest that we embrace them without telling us what these other things are or why we should embrace them. First, the whole point of science is to be useful/effective, and since you state that twice, I can only conclude that you are confused about what science is. Second, I really don’t understand what you are asking, and suggest you be a bit clearer in what you’re asking. “Reality is having an intelligent conversation with the universe.” (said by an physicist whose name I can’t recall) Science is the only communication vehicle that allows this intelligent conversation. I wished you defined what worship means to you, because I have never met anyone who worshiped science in the way I have met people who worship god. Some can be smitten by it, or like it, or be fond of it, or be confident in what it does so well, but worship? All people that I know who appreciate the importance and value of science just don’t don lab coats and spend 24 hours in science labs. They experience their personal lives subjectively, embracing metaphorical narratives that describe their lives to themselves and others. Worship is an alien concept personally to me. I have never felt it in my entire life. If evidence for your god was present, I still would not worship this entity, I would merely accept its existence. It seems that certain religious believers project what they do onto others who do not worship, gods or anything else. Recognition of what science does so well does not translate into worship. The god hypothesis is a failed one having no predicting or explanatory ability, and it has not, is not, and will not further this intelligent conversation with the universe—the only one worth having. Science offers the chance to find out if a belief is real. It is the only way to do that, indeed it’s hard to conceive of any other way to see what reality is like. What would they be – reading the entrails of animals? Using Tarot cards? The problems described for induction aren’t in reality problems at all. Science works because we get consistent results from experiments and we get consistent results from experiments for a good reason – the universe is on average very cold and empty, and so is quite an ordered place. Science doesn’t have advantages over other approaches, as it’s the only game in town. The only way to know what is real is to test ideas of what is real against reality. What else are we supposed to do? Even Hume didn’t say inductive reasoning is non-rational. He just said that it doesn’t give absolutes and that it isn’t perfect. For those who already accept this, like scientists, it’s no weaker for it. And as Mike said, science goes well beyond inductive reasoning. Meanwhile, you answered your own question. What science has to offer over anything else is that it is effective. And it is the only thing that works reliably. Until something emerges that you can know through religion alone (which I assume is your favoured alternative), and defend from those of other religions through religion alone, and be confident that you haven’t simply been convinced, or convinced yourself, through religion, there’s no contest. Finally, just because science is used as an alternative to an object of worship for explaining the world around us doesn’t mean science itself is worshipped. It just means science is used, and relied upon, and for good reason. What does science have that “the others” don’t? Science offers a reliable method for producing certain belief that surpasses, say, religion. Yes, science has its limitations, but as you say, it is effective. I will embrace these unnamed “others” of yours when you can demonstrate that they are comparably effective. Your insistence that we can’t “know” the sun will rise in the morning seems ludicrous to me. Yes, we don’t “know” that the sun will rise in the way that we “know” that bachelors have no wives, but if you are not willing to bet the farm that on the regularity of the earth’s rotation, you are insane! Semantics will only get you so far. Regardless of how you want to use the word “know”, you would be unable to maneuver through daily life if you treated all of your inductive conclusions as suspect. Your willingness to use your beliefs depends on how certain you are in those beliefs. I don’t think it’s possible to reject certainty per se: you’d be in deep doodoo. (You’d have to relearn to tie your shoes every time you went out. You’d have no confidence in your ability to drive a car, cook an egg, etc., etc.) Instead, you acknowledge certainty, you weight it against uncertainty, and you act on it. I have certainty in non-scientific matters. For instance, I am certain that to cause suffering is morally wrong (other things being equal), and I am certain that science cannot prove this is so. But if you want me to treat astrology on a level with astronomy because they both involve uncertainty, you’re off your rocker. First of all, science is not just induction. Empiricism, induction, and deduction are all parts of the scientific method. Second of all, science isn’t about proof. You get proof in math, and theory with a high degree of confidence in science. Third of all, find me one time someone found useful information in a crystal ball and I’ll buy your line that such nonsense is equally as valid as the scientific method. What you’ve fallen for is the trap that is all too common in apologists: confusing our tentative acceptance of the things we’ve reasoned out for absolute certainty that our conclusions are correct. We know we can be wrong. We use science because it gives us our desired results. We accept it because it is useful. When you say “it’s not the only thing that works,” I’d really like some evidence for that. 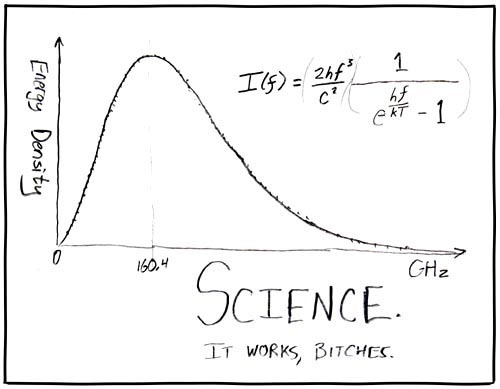 Any time we know something works, we only know it because we’ve used the scientific method to show that. Science is not wrong for dismissing other “ways of knowing.” Science is not wrong for being arrogant. Arrogance comes with being right consistently. You may want to try to paint science as science-worship, but the fact of the matter is it works and other stuff just doesn’t.